"Discover the secrets of the Midnight Castle!" Midnight Castle is a hidden object game that incorporate social features and adventure very well. The game is very well designed. It has great graphics and rich colors that will keep your eyes peeled for hours. If you are getting this game to occupy a child, it will definitely do a great job at that. 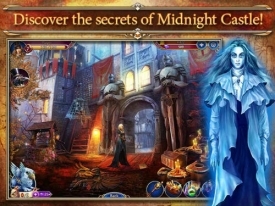 The game begins with a series of mini hidden object games - which can seem very repetitive at times - that will lead to the entrance of the Midnight Castle. This may seem like a very difficult task once you start the game as it takes a long time to get into the castle. Don't worry, there are many people throughout the game that you will interact with to help you along the way. They will give you goals to achieve. The quicker you achieve those goals, the quicker you will get into the Midnight Castle. Like all other Big Fish Games, there will be in game purchases that you can take advantage of, however, unlike other big fish games Midnight Castle does not bombard you with advertisements for in game purchases. It's almost as if the developers behind this game were really focused on an immersive experience for the player that focused on the story and the sometimes complex hidden object challenges. But of course, if you are one of those people who like to make in game purchases because it enriches your experience, the option is there for you to customize the game the way you like.